Sukanya Samriddhi Account is popular scheme launched by government two months back.We were probably first in providing information about sukanya samriddhi account and its benefits. Sukanya Samriddhi Account is highest interest paying scheme. Detail of Sukanya Samriddhi Scheme is given below. Sukanya Samriddhi Account can be opened on girl child name by her legal/natural guardian. Account can be opened up to the age of 10 years from the date of birth. 1 % Interest will be paid on Sukanya Samriddhi Account for FY 2015-16. Maximum amount deposited under this scheme will be 1.5 Lac per year. Tax benefit of 80 C is applicable for amount deposited under this account. Interest earned and maturity amount for sukanya samriddhi account will be tax-free. Partial withdrawal, maximum up to 50% of balance is permitted after account holder is attaining age of 18 years. Account can be closed by legal guardian after competition of 21 years. Premature closer of this account is allowed after completion of 18 years provided girl is married. Although two months are passed still many banks and post offices are not aware about this scheme. I am receiving multiple queries asking about where we can open Sukanya Samriddhi Account. So here is the list of bank where you can open this account. Circular for Post office can be downloaded from here. Application form for opening this account is yet not available on post website, however you can submit normal saving account opening form of post office to open this account. You can download Application form of opening Sukanya Samriddhi Account from here. I am sure that after listening to benefit of this scheme you must be eager to open this account. It is advisable to approach State Bank of India or Post office to open this account. 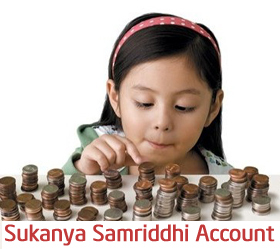 Have you opened sukanya samriddhi account? Do share your experience with us. « LIC Childern’s Money Back Plan (Table 832) – Should I buy? I heard that it is a taxable income after the maturity.So do we need to pay tax at the time of maturity. It is tax free and NO tax is applicable on this scheme. my daughter born in 01/03/2005. You can apply for Sukanya Samriddhi Account. Relaxation is given for 1 year means up to age 11 account can be opened. Banks started taking sukanya ac application. Can you share the calculation formula? How they calculate interest ? Who can withdrawn the maturity amount of ssy,parents or daughter ? Girl Child is allowed to withdraw amount from Sukanya Samriddhi Account. My daughter is now 9 years old. If I deposit 5 thousand yearly then how much I will get in next 21 years.Can I open SSA in any of the bank. If you deposit 5000 Rs per year you will get 2.66 lac as maturity amount after 21 years.